In life, there are a lot of little details that seem to follow us regardless of where we go. For instance, you will probably always be mentioning your degree, the college you graduated from, your family name, your social security number, previous places of employment, and other similar pieces of identifying information for the rest of your life. However, one piece of information you do not want to continue to list is your arrest record. Even if you only received a minor criminal offense, a record is a red flag on any application for any level of job and it is something that you are going to have to explain every time you apply for a job, credit, an apartment, or similar application that requires a background check. The good news is that you may not have to lay claim to a simple mistake that happened years ago if you look into sealing a record. Maybe you had too much to drink one night or were involved in a situation that led to an accomplice charge, but either way five minutes could hurt your reputation for the rest of your life. In Arizona expungement is actually referred to as setting aside a judgment. You can set aside a judgment for almost any minor offense excluding a few. This means that you effectively your criminal history will be erased and it will appear as if nothing ever happened. Those that want a fresh start are going to want to look into this process and everything it entails. Erasing your criminal history is not an easy task however, and you will have to petition the court and make sure that you have completed your full sentence before you being the process. Many people choose to hire a lawyer because they do not want to take a gamble with their personal future, but you can handle the process on your own with this great kit that will help you to expunge record in Arizona. 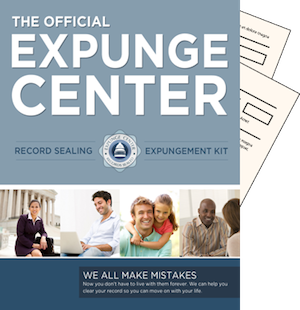 Our expungement kit has everything you need in order to remove a criminal offense from your history including all of the paperwork, petition, and a general outline of the process and what to expect. With this simple kit you can unlock your future and start fresh with a new future in front of you. Before beginning the kit make sure that your sentence is complete however, as no judge in Arizona will set aside a judgment before you have completed all terms of your sentence. This includes fines, community service, jail time, probation, and anything else that the judge might have ordered you to do. In addition, you should be aware that there are some crimes that cannot be sealed or expunged in Arizona. Some of these crimes include a crime in which a deadly weapon was used or a case that resulted in severe physical injury. A driving violation that occurred while the defendant held a suspended license will not be removed either. In addition, any crime that placed a child under 15 in danger or was sexual in nature will not be sealed. So long as your crime does not fall under these perimeters then there is a good chance you can get it removed. There are dozens of benefits to having a record erased including the ability to own a gun, to vote in a presidential election, and to actually find a job. You can have these and more with our simple Arizona expungement kit that will help you provide the right documentation to the judge so that you can have your criminal history wiped out forever.